SurreyK has just returned from holiday in Portugal. Portugal is a country famous for peri-peri chicken, seafood, spicy sausage, chimneys, bullfighting, brightly coloured tiles, port and Madeira wine. We were lucky enough to be unaffected by the recent forest fires during the two weeks we stayed. Around 2.3 million British tourists visit this beautiful country every year. This dish makes winter bearable. 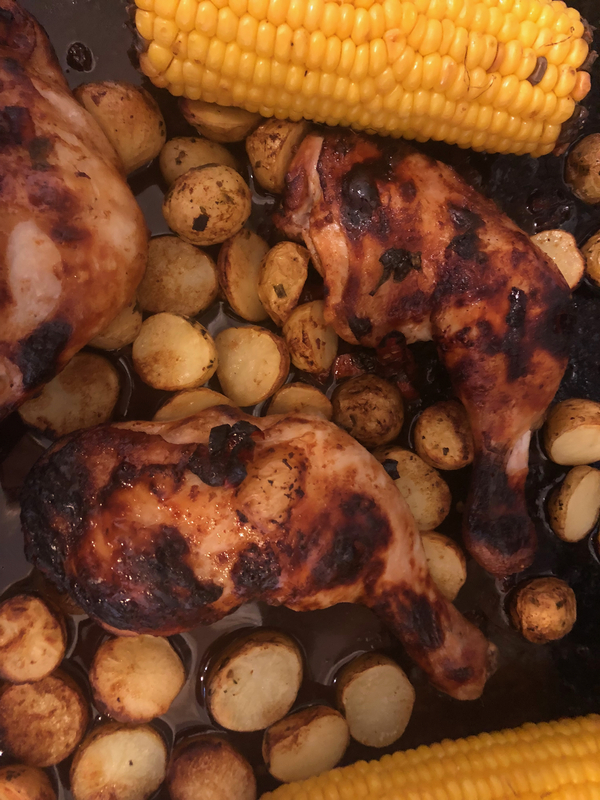 I wanted to share my Portuguese (Peri-Peri) chicken recipe with crispy potatoes and smoky, spicy corn on the cob. 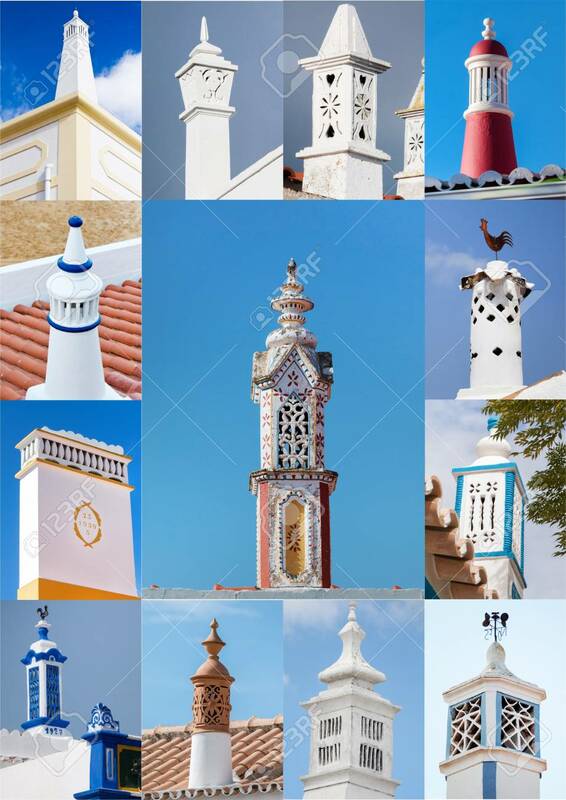 Staying just outside Albufeira, one on my favourite characteristics of Southern Portugal was its ornamental chimneys. I’ve no interest in whether it was the Moors or the Arabs who started them but they are utterly fascinating. Some claim Muslim’s who lived in the Algarve for more than 500 years and Spanish neighbouring al-Andula’s were responsible. The chimney’s vary from different shapes, some more delicate in their construction. Others flaunt beautiful tracery, others represent miniature clock towers or houses. There is an undeniable Moorish influence in the south of Portugal with regard to architecture and ornamentation. If you are interested in this type of design then Silves castle in the Algarve is also with a visit. 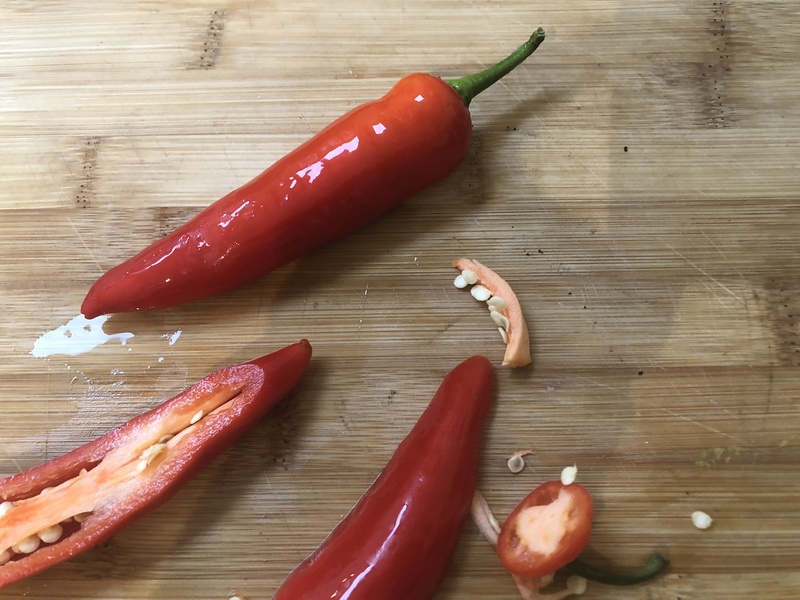 Chillis and paprika are the base of marinade. 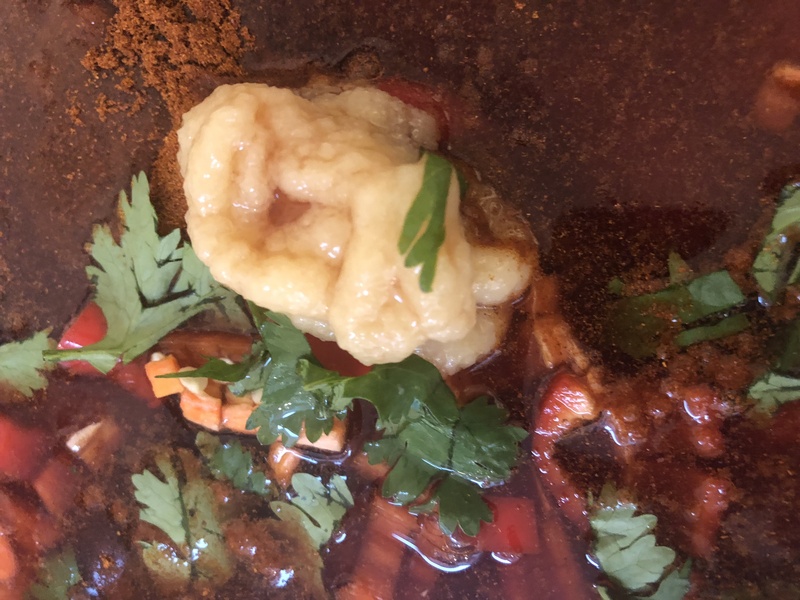 I hope you enjoy my Portuguese chicken recipe. A pinch of salt and pepper to season. Preheat oven to 425F, 200C. Gently fry garlic chicken in a large frying pan to brown the skins a little (3-5 minutes should suffice) Remove pan and set aside. Make the marinade by blending the olive oil, chillies, honey, paprika, garlic paste, salt and pepper and coriander into a paste with a blender or food processor. Brush a layer of marinade on the bottom of your baking pan. Place thinly sliced potatoes on top of the marinade and sprinkle with a generous pinch of kosher or rock salt. Brush all sides and crevasses of the chicken with the marinade, coating fairly heavily. You will need more marinade during cooking, so be sure to save the remaining. Place chicken, skin side down on the potatoes and place in the oven. Turn chicken over after 15 minutes, and place back in the oven. after 10-15 minutes, brush more marinade all over the chicken on the skin side, really lathering it up. Return to the oven and bake until cooked through. Lie two pieces of corn on the bob on the baking tray for the last 15-20 minutes of cooking. Remove the baking tray when the chicken, potatoes and corn on the cob are done. Set the tray aside for the chicken to cool for a few minutes. 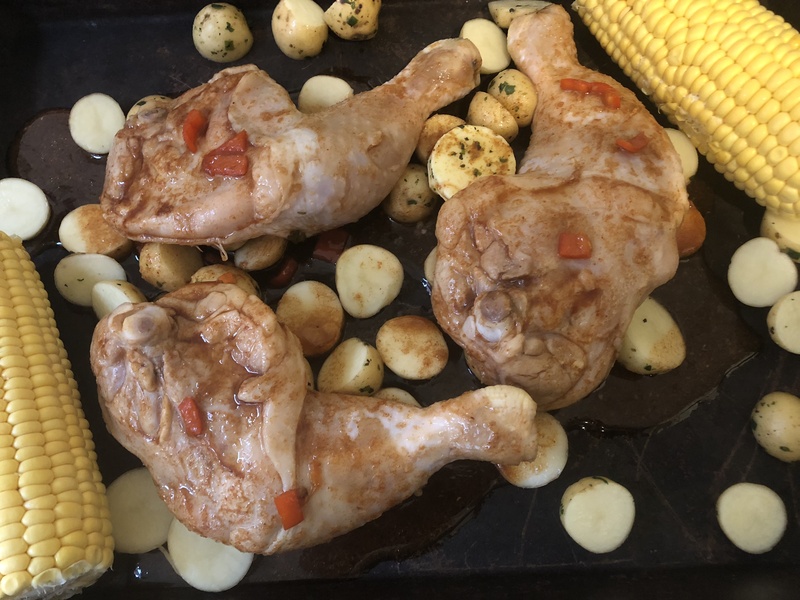 Serve chicken, potatoes and corn on the cob together. Tomorrow I’m taking a vegetarian cooking course at Leith’s in London with the wonderful Jo Pratt so watch this space for that write up. I continue to work with Artizan Interiors so stay tuned. Amazing1 Yes I had some recommendations from a friend who lived there too for a few years. if you want to share any more of my recipes on Fiesta Friday then feel free. Best wishes. Emma. I have made Portuguese style chicken before and I loved it! I am sure I’d love this version, too! I’m so glad you liked the recipe. We did enjoy Portugal. It’s a beautiful country.